National Park Service. Adapted with permission. 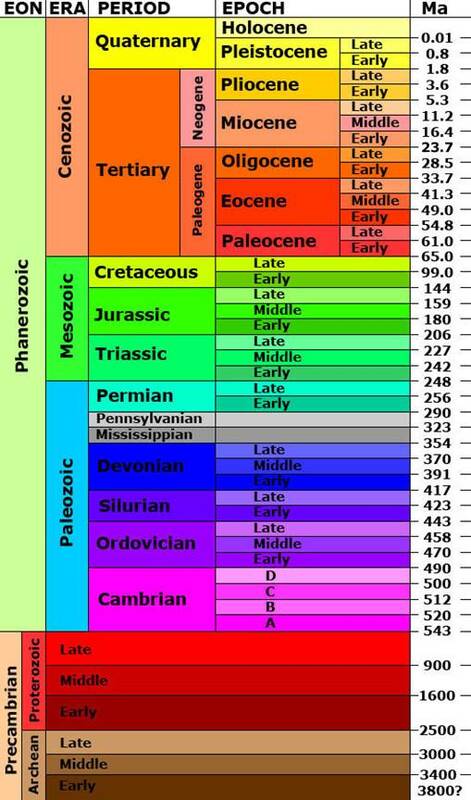 Geologic time can be difficult for people to understand. Our own lives are so short when we compare them to the age of the Earth, that the hundreds of millions of years of geologic time are almost too much to grasp. But for us to understand Earth activities today, we must have at least some basic understanding of geologic time. For example, how can we predict the effect of human activities on the global climate without understanding past climate changes and periods of mass extinction? By studying the past, we can better understand the present and more accurately predict future changes. Scientists do not measure geologic time on a clock or calendar. They use a timeline that is based on the age of rocks and the fossils found in those rocks. The geologic timeline also includes the changes in life that occurred over millions of years. To understand how a timeline works, you will make a personal timeline and compare it to the geologic timeline shown here. You will need a partner to help you make your timeline diagram. You will be using your arm span from fingertip to fingertip, so make sure your paper is big enough. Lie down with your arms stretched out to both sides on your paper. Have your partner carefully trace the outline of your hands, arms, and, if there is enough room, your head, too! Choose the longest fingertip of one hand on the diagram and label it “Birthday.” Label the longest fingertip on the other hand “Today.” Draw a straight line from the Birthday fingertip all the way to the Today fingertip. This is your timeline. Number each of the lines on your timeline using years. Put the year you were born on the line where it says Birthday. Mark each equal section with the next year from your birth. Your Today line should have 2009 under it. When you finish, compare your timeline to others in your class. Now, compare your timeline to the geologic timeline here. Where would your timeline fit into Earth’s timeline? How much space would it take up? What does this tell you about the age of the Earth compared to your age?